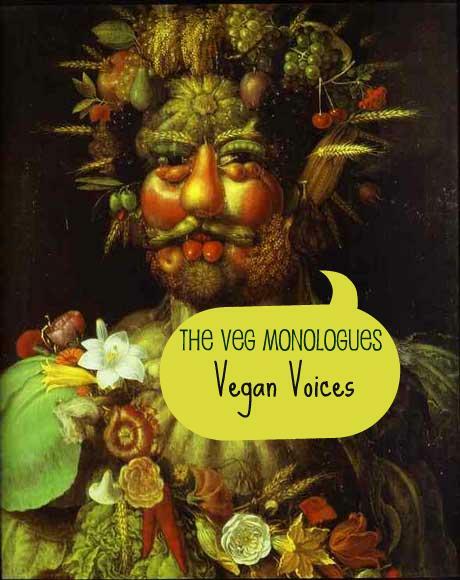 The Veg Monologues: Vegan Voices is vegan advocacy in theatrical form, though more than mere agitprop. It is a complete stage show incorporating performance, music and projected images to tell a multi-voiced story, a story of people from across the United States and all around the world, ordinary people who have made an extraordinary choice to lead a more compassionate, healthful and environmentally responsible life by going vegan. Based upon interviews with vegans of a variety of backgrounds and ages, as well as including original material written for the production, the monologues are variously funny, informative, touching and impassioned — and especially heartfelt. Those involved with the creation of The Veg Monologues have experienced profound positive change in becoming vegan and have a deep need to share their experience. More people are coming to realize how profoundly life-affirming veganism truly is. Books such as The China Study and documentaries such as Forks Over Knives have recently led many to consider adopting a plant-based diet for health reasons. And yet, vegans still represent only about 1% of the total U.S. population. Though many people “admire” us, there are still those who aren’t quite sure just what it means to be a “strict vegan;” who wonder where we get our protein; who think that most, if not all vegans are weird, anti-social, angry radicals obsessed with tofu. It is the intent of this project to change the public’s perception of vegans. We want people to know us as unique individuals, each with our own story to tell within the larger story of veganism. Our voices form a chorus that is all the more resonant for its diversity: from elementary school-aged to college-aged, from middle-aged to senior-citizen; from Japanese female to African American male; Dutch, German, Guatemalan; gay, straight; Christian, Jewish,– we are your fellow citizens, your neighbors, your friends, your family members. We are vegan and proud of it. Listen to us.